. A greater voice than the Word of God??? Home Media Sermons by Pastor Nicki Coertze Non-series Sermons . A greater voice than the Word of God??? A GREATER VOICE THAN THE WORD OF GOD??? I was going to preach sermon number 9 in the series regarding “the All Sufficient Bread of life’ where we would have focussed on the theme “phony seekers, shrinking away from the faith”. However that sermon is too long and I would not be able to preach it completely today, so it will have to stand till next time. For today, then, just a short thought from a different text. What we would have looked at today in John 6 are the verses that deal with the crowds coming back to Jesus the next day after they experienced the miracle of the feeding of the multitude. They do what so many do, they miss out on the understanding of signs and wonders, which is to point people to Christ. They are like the person looking for Polokwane, and then arrives at a sign that says Polokwane 40 km ahead. This person then stops and admires the sign, and never gets to Polokwane. These people were like that. They admired the signs, but did not come to Christ. So, the question this morning is this. Is there a greater voice than the Word of God? 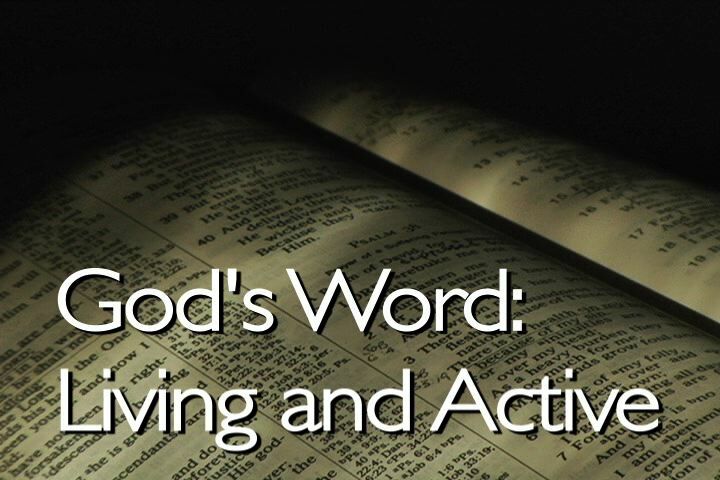 Is there anything more authoratative, anything that man will obey rather than God;s Word? Let me take you to a short statement in Scripture that fits with what we are seeing in John 6 where people rather trust miracles than God’s Word. In Luke 16 we have the story of the rich man and Lazarus. Now for time sake, I am not going to give you context or look at the beginning verses. For this sermon we are going to imply that you understand all of that. We will sometime do a few sermons on that text. Wow, here is a guy who lived his whole life wrong and ends up in hell and he still wants to debate. He has general compassion for his own family. He knew that his fate was fixed, he was in hell, and guess what, he knew based on lifestyle that his 5 brothers would join him there, and it would not be a glorious family reunion in hell. On earth they had ‘hell of a lekker parties’, now it is just plain hell. He treated Lazarus with disdain on earth, he still treats him with disdain even though he knew him to be in the presence of Abraham, and carried there by the angels of God. But he does care about his family. We can assume that the Pharisees would be hearing this as a man who is religious and blessed by God, and therefore had religious brothers who were into Judaism and Pharisaic Judaism. But they were going to end up in hell just like he did, and he knew it because they weren’t aware of what hell was like, and so they weren’t concerned to avoid it. So what he basically says is this, “Look, my brothers don’t have enough information about hell. That’s the problem. If I knew what I now know, I wouldn’t be here. So could you please send Lazarus to tell them what’s here so they won’t come.” No words of repentance here, too late and impossible in hell in any case. No Holy Spirit. But Jesus creates a fictional concern to get the point of the whole story: Why do people go to hell? Why did the rich man go to hell? Why? And why would his brothers go to hell? Moses and the prophets simply refers to the Old Testament and from that they would have everything they needed to know about the nature of the all-holy Creator and Law-giver and Judge, the eternal and true God. From the Old Testament they would have had ample and sufficient information about their own sinfulness and need for repentance. They would have had truth concerning salvation by grace alone through faith alone, and justification comes by grace through faith. They would have known that God offers complete forgiveness of sin and escape from judgment and wrath and condemnation. They would have understood even from the Old Testament that alien righteousness coming from God is imputed to those who put their trust in Him. They would have understood from the Old Testament that substitution is the way God deals with sin. And they would have understood if they had believed the Old Testament that there was coming a sacrifice and coming a Messiah, and coming a Saviour who would crush the head of Satan, who would provide redemption for His people, who would be the suffering Substitute, who would then establish His throne and bring all the unconditional promises to Abraham and David to Israel and the world. He again gets a little argumentative here. He is like the typical man today who has all the answers but does not care what the Word of God says. Have you not heard this kind of argumentation? I am always stunned at man who thinks they have better answers than heaven itself. Let me dramatize a bit. But father Abraham, rugby players will not identify with Nicki Coertze, if only we can have Brian Habanna to tell his story, rugby players will believe. But father Abraham, who is Johan Hulshof to share the Word of God, if we can just have somebody from America with lots of stories, but Father Abraham, the preaching of God’s word will not change lives, come on, face facts, people have so much to do with their lives, church is low on their agenda, but if we can have some miracle worker, then we will see people change. “No, father Abraham you are a little bit out of touch, but if someone goes to them from the dead, they will repent.” “Father Abraham, you’re wrong. They don’t have what they need. Scripture’s not enough. Scripture’s not sufficient. They had Moses and the Prophets; I had Moses and the Prophets and guess where I am, I’m in hell.” The Pharisees had Moses and the Prophets and they were headed for hell, and that was the point of telling them the story. But if someone will rise from the dead—a powerful sign which again indicates that in the minds of the people listening to the story, the brothers also knew Lazarus, and if Lazarus, whom they knew to be that wretched beggar comes back, they’ll recognize the same guy who was there by the gate, and he can tell them he’s been to hell and back and warn them, and certainly they’ll avoid hell. Father Abraham you don’t get it. Simply look at churches when they have a speaker who claims to have been dead then churches are full. Now, Father Abraham, I know there detail is a bit contrary to Scripture, but people will listen, because they have a story to tell, and people like stories, people like special speakers, people like a show, people like emotional stuff, that is what we need to give. Well, the problem is you can’t avoid hell just by not wanting to go there anyway. You have to avoid hell by following the path of salvation revealed in Moses and the Prophets. Is that true? Who raised people from the dead? Jesus. Who rose from the dead himself? Jesus. Did they believe? No! In fact, in an interesting divine coincidence, Jesus raised a man from the dead by the name of Lazarus. The rulers knew it, and it was what motivated them in part to execute Jesus. We don’t want to go to hell. He warned, and religion won’t protect you—only the truth, the gospel truth, the saving truth, the salvation truth revealed on the pages of Scripture completed in the New Testament through the work of Christ will rescue you from hell and take you escorted by the angels into the full fellowship of all the saints, including Abraham and all faith. Church family. May we never put our focus on supposed miracles, feelings, fads, programmes, special speakers, stories, events? Let’s not wake up when it is too late.